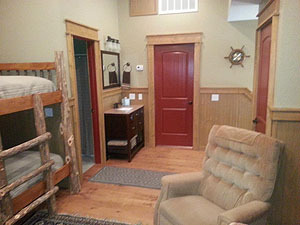 Cabin rentals at Guntersville Alabama. Private complex for family or group gatherings. 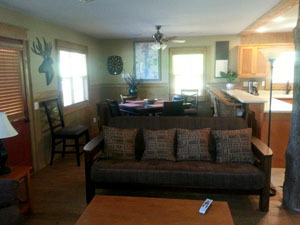 You'll be very comfortable in this 3 bedroom, 2 bath vacation cabin with loads of amenities. Relax on the front deck or at the fire pit in the evenings. Don't forget your fishing pole and bait to enjoy fishing in the stocked ponds (catch and release). This cabin offers plenty of privacy. 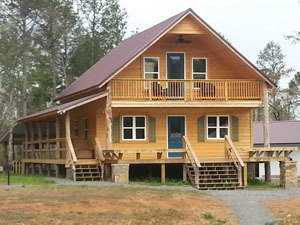 Guntersville Lake boat launch access is just a few miles from this vacation cabin. 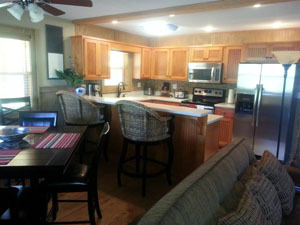 The open floor is great for meals and gatherings with plenty of seating for everyone. At meal time, you can dine at the table or sit at the kitchen bar and chat with the cook. The kitchen is fully equipped. 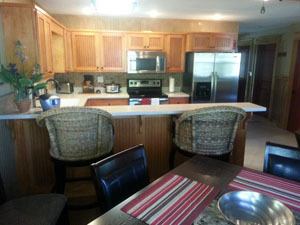 There is a Refrigerator/Freezer, Stove, Dishwasher, Microwave, Coffee Maker, Crockpot and Toaster. There is also a Charcoal Grill for grilling steaks or catch of the day from Lake Guntersville. There are three separate bedrooms - we have one bedroom downstairs with a Queen, and one upstairs with a single size/over Queen size bunk bed. 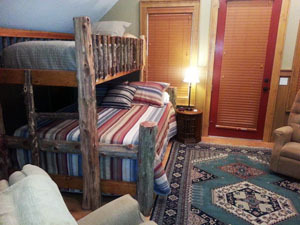 The third larger room has a two single size/over Queen size bunk bed and one single over single bunkbed. 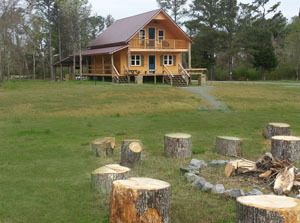 The cabin sleeps 12. 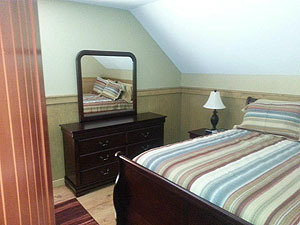 We also provide you with a Washer/Dryer, Iron/Ironing Board and the Linens & Towels you will need during your stay. This two bedroom & two bath getaway has an inviting open floor plan with lofted ceiling houses the living room, kitchen & dining with one bedroom and a full bath on the main floor. The upper level features two bedrooms and a full bath with access to the covered porch. Relax anytime in a rocker on the wrap around porch off the main level. 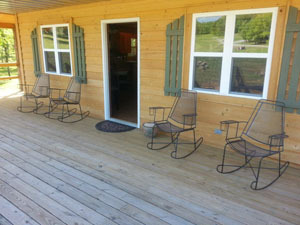 Catch & release fishing in the ponds on the property, bring your horses for riding or hike on all the wooded acres. Reserve your vacation with us! 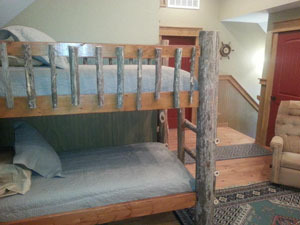 Sleeping Accommodations: 2 queen, 2 twin w/queen bottom bunk beds and one double twin bunk bed.